We are still loving our newly painted bench using Pinty Plus Chalk Paints. 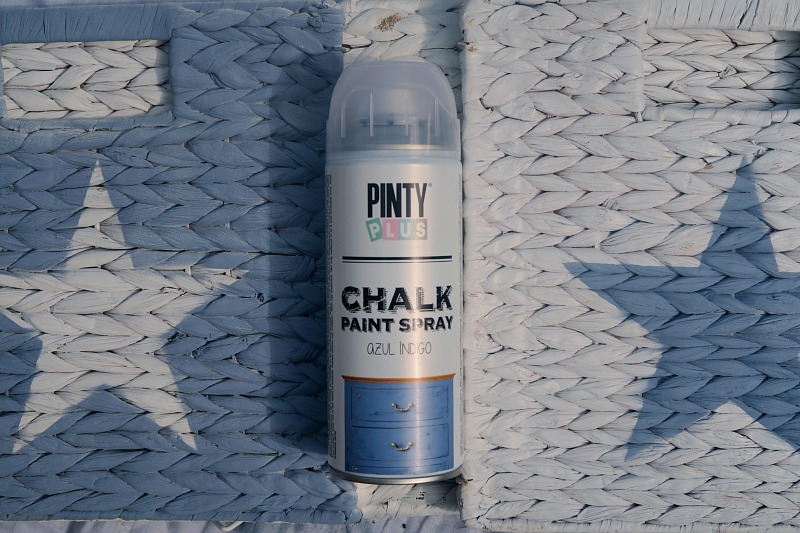 This month I had the difficult decision to choose a new project to use the Pinty Plus Chalk Paints on and choose a new colour from the 18 available colours. Novasol Spray UK kindly sent me 3 new colours to test out but this month I am using the Blue Indigo colour. 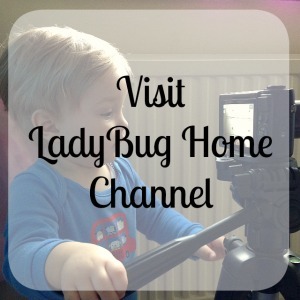 One of the challenges of having small children is how quickly toys accumulate everywhere in your home. Several months ago we purchased a white cube storage unit and white woven cube boxes from Argos. 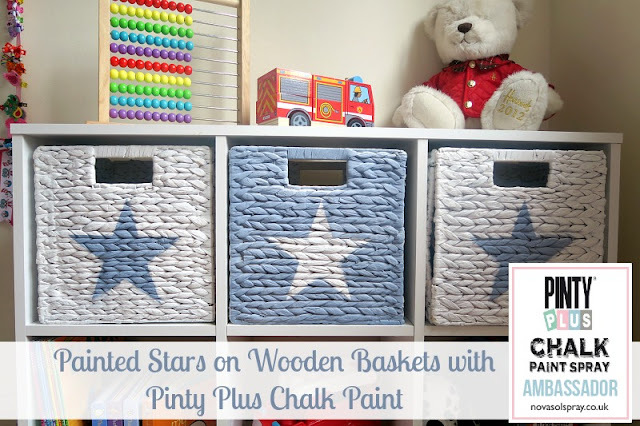 Even though this has been a perfect solution to the toy mess in my daughter's room, the white storage unit with white baskets could use some colour. I decided to create a simple star pattern on the front of the three cube boxes. Two boxes would have a star painted in Blue Indigo paint and the remaining box would be painted so that the star was white and the surrounding colour was Blue Indigo. 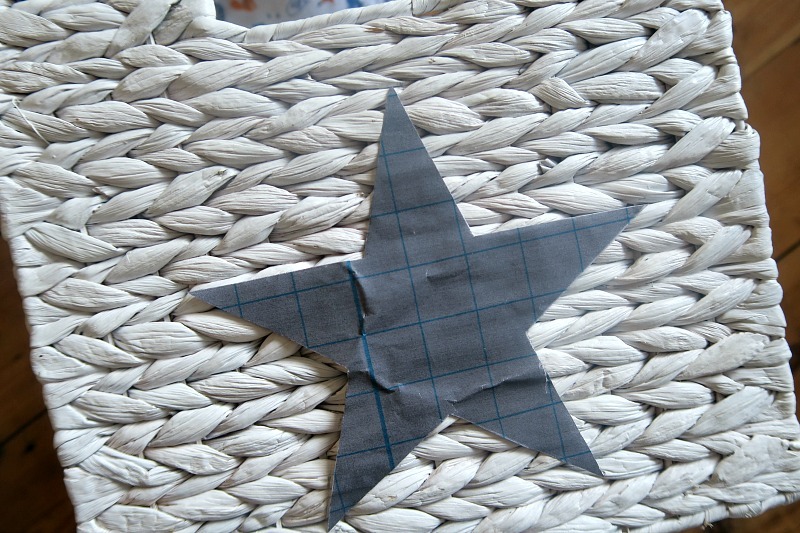 The first step was to measure and decide on the size of the star. For this project a star in the dimensions of 7 inches was ideal. I created a new document on the computer and inserted a star shape. Resized the star shape to 7 inches. 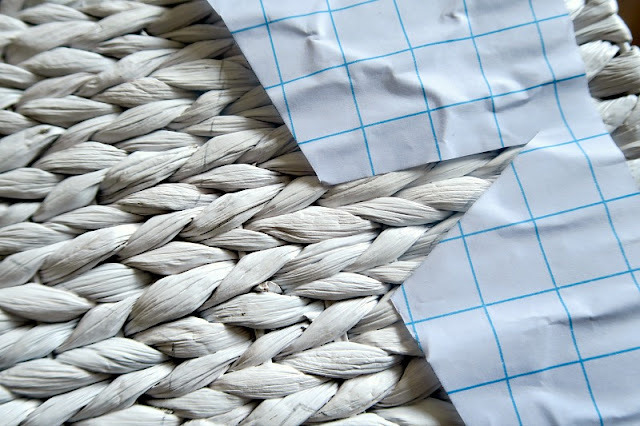 I used some Clear Sticky Back Plastic - 3 Metre Roll (Amazon Affiliate Link) and cut the plastic sheeting to the size of a A4 to run through my printer. I did test a quick test to make sure that the sticky plastic was not going to remove any of the white paint if applied to the front of the white boxes. I carefully cut the star shape out and used the star cut-out to trace the star outline with pencil on the front of the cube. Now it was about making sure that plastic was going to cover the area surround the white star shape. 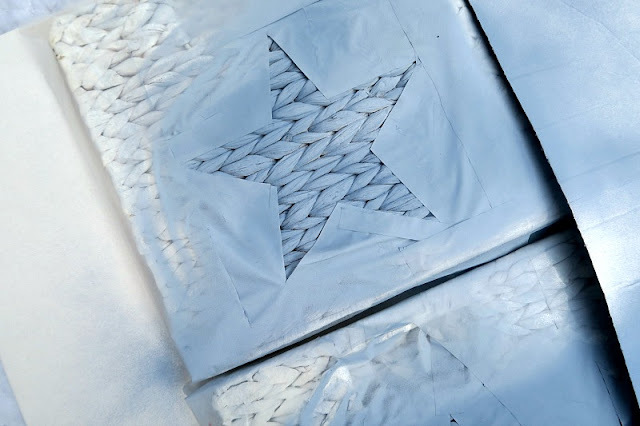 I found that I need to cut a few small strips of sticky plastic to make sure that all the star edges and all the surface that did not want painted was properly covered. I removed the cube bottom so that the cube's front side could be painted laying flat. I repeated this process with the second cube box. Now it was time to paint. I laid the cube outside and used piece of cardboard to cover the side that was not going to be painted. After a good shake of the Blue Indigo Chalk Paint, I carefully applied light sprays of paint going left to right and back. 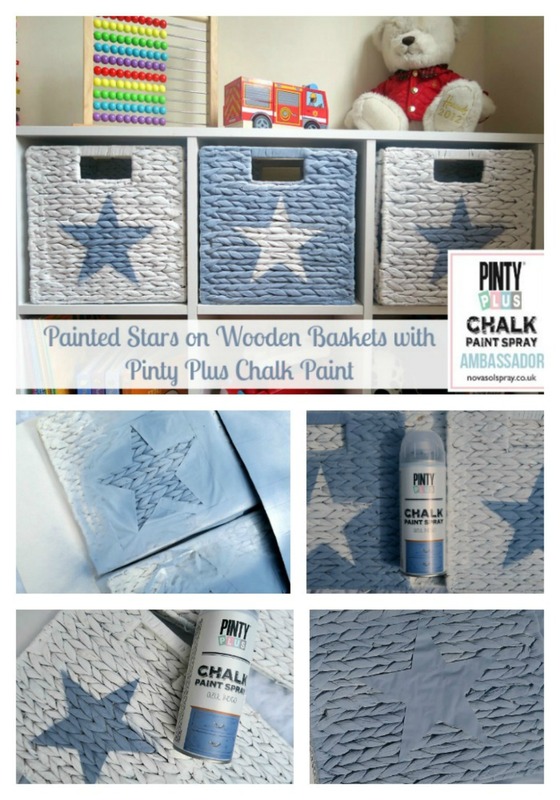 The Chalk Paint covers beautifully on this wooden painted surface so only one layer of paint was needed. The key is make sure to do a very light layer of paint from at least 10 inches from surface. 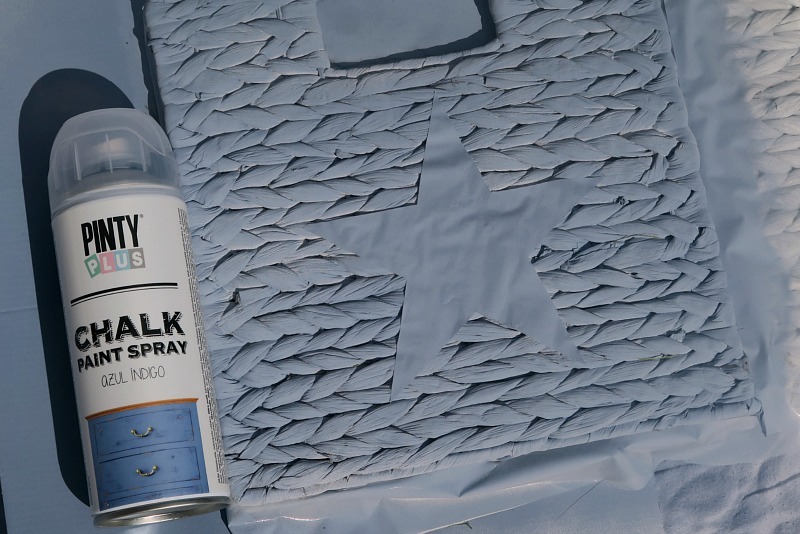 Creating a light mist of paint so that the paint does not bleed under the clear plastic edges. For the third cube box, I applied the sticky plastic star cut-out directly to the front of the cube in the middle. Using strips of sticky plastic, I covered the edges of the sides and back side that I did not want Blue Indigo paint on. Using the same method of light continuous rows of paint to create an even coverage. I am still very impressed that the paint is dry to touch with 15 minutes and really brighten up these cube boxes. The paint covered the wood without any issues. There is no paint smell residue and truly loved by daughter. 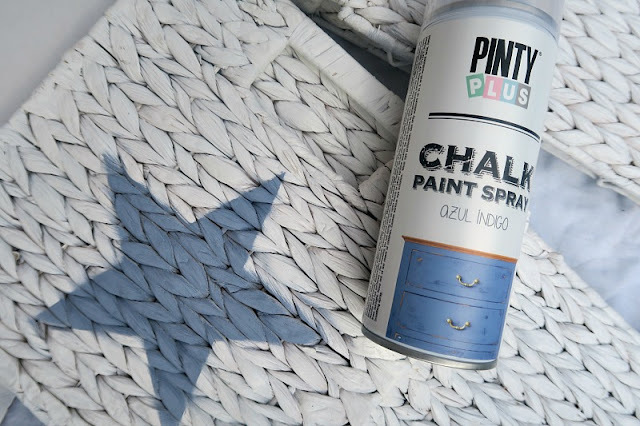 Why not purchuse a couple cans of Pinty Plus Chalk Paint Spray and share your projects on social media using #PintyPluser. What would you love to paint today?